Change is hard even if the change is exciting. Managing change and introducing new concepts is hard on leaders as well. Finding the balance on when to push and when to coast is a fine science. I like change. I enjoy the process of change. I get bored easily with the status quo. I've found that I enjoy looking at opportunities to do education differently but not for the sake of different- for the sake of solving an issue. 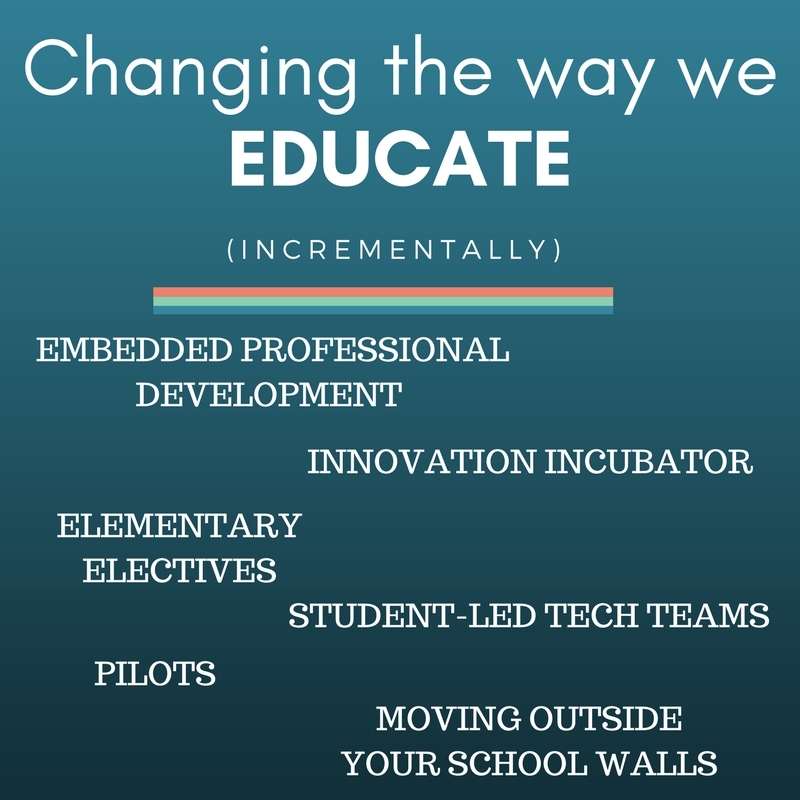 Below are a few ways I've been a part of creating avenues for learning differently. Some went amazingly and some have limped but I believe each concept has had an influence on changing culture in our school and/or creating opportunities for myself to have a voice or challenge. 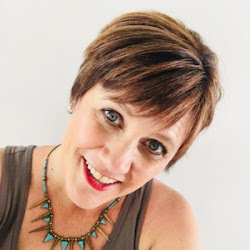 Embedded PD- If you are in an administrative position you know that finding time for professional development is hard. Recently, I had this revelation that our teachers needed more training on the design thinking process in order to support and understand our goals for STEAM education. It became abundantly clear that there just wasn't time to do a day of PD on this topic so I created an experience for all school learning... Designing CCS. Every week I would send an email out to our teachers that would give them information about the different steps of the design thinking process and they would walk their students through this process. They were learning along side their students. Not all my teachers have finished but those that have felt like the process was a good one for them. Next step for me is to decide how to move forward with the teachers that did not go through the process. Innovation Incubator- Last year our fifth grade students had the chance to be part of a local innovation competition where they "shark tank pitched" their concepts to some faculty at our school and one person's design was submitted to the local competition. This concept spurred me to look deeper at innovation from a crowd-sourcing point of few. Reading the book Edupreneur and meeting a few new people at ACSD Empower18, I am ready to take this concept to a bigger level next year by creating opportunities for teachers to submit a proposal for innovation after going through the design thinking process with their idea. Innovation is best when it is organic and based on need and passion. I'm looking forward to what the small pilot of last year might lead to next year. Elementary Electives- One day when talking with our school president I said "wouldn't it be awesome if we could do electives with elementary students?" And so it began. Our 4th, 5th, and related arts teachers offer elective opportunities based on their passions. We have things like archery, basketball, knitting, woodworking, digital gaming, makerspace, campus caretakers, digital music, etc all being offered to 4th and 5th grade students for 45 minutes on Friday afternoons- you know the time...when their brains are mush. Why not offer something that might grow an interest? I love seeing this in action. It's a very simple way to embed something different into the curriculum and see how it goes. It's also a great way to pilot a concept before implementing it on a bigger scale. For many of our teachers, it gave them an opportunity to teach something they love but that just doesn't fit into the curriculum. Student-Led Tech Teams- Do you want to see student empowerment? Do you want to see a culture of collaboration and aiding others? This was it for me. I've always wanted a student-led tech team but couldn't find the time to do it. Electives allowed me to have a team last year that created how-to videos for commonly asked questions at school regarding technology. The process was an amazing one and the students even got to present at the student showcase during Georgia Education Technology Conference to show their website they created. This year's group is creating an Escape Room concept that will teach the teachers more about the STEAM tools we use at school. Something the teachers said they wanted to be more knowledgable about. 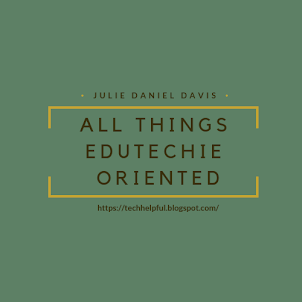 Not only did I gain a tech team in this endeavor, I also gained some credibility with some students because I empowered them in the roles that they enjoy. Pilots- Look for ways to incrementally try new concepts, pedagogies and learning styles in an contained way. I love trying new things but I also know from experience that they often don't go the way you expect out of the gate. Our middle school blended learning math pilot has been a great sense of excitement for me as I have seen our school move away from the traditional sense of teaching middle school math to a more individualized approach. It's been messy, lessons have been learned and mindsets have been changed but I can't imagine taking on something of this magnitude across the board in year one. Pilots allow for a sense of experimentation in a safety net. Change doesn't have to come roaring in like a lion. Change can be that constant nagging that says "Hey, look at me. I'm different and parts of me are really good. What else can you do with what you learned from this change?" 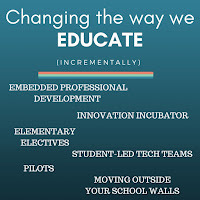 Outside Your School Walls- There have been times that I've been frustrated with a lack of change within my own school. Sometimes I just need to be able to voice my educational thoughts. My good edu-friend Greg Bagby calls me an educational rebel. I honestly wear that title with pride. I don't think it's wrong to consider some parts of education as antiquated and to want more for our students. Because of this, I have often found my empowerment outside of my own school. I blog my thoughts on a regular basis for all to see. I've gotten involved with the organization of yearly Edcamp Gig City. I've created the monthly coffeeEDU meet up for Chattanooga area educations based on the hashtag #CHAedu and I've started speaking at educational workshops and conferences as well. Sometimes changing education is being a voice whether anyone is listening or not. Sometimes it just means being able for me to say my visionary ideas in a safe environment. Change isn't easy. Seeing your self as a change agent can be both empowering and scary. You won't be everyone's cup of tea. Creating safe avenues for change that don't seem so demanding or oppressive can change culture slowly but significantly. Sometimes I see the change most often in our students ability to feel safe to be creative. Sometimes I see the change through conversations with teachers opening up to new ideas. Sometimes I see the change in me, when I realize my change ideas aren't always good and find a way to balance. Changing incrementally by introducing concepts in a safety net makes sense to me.